General Admission Tickets get you full access to all off track activities for the whole weekend. FRIDAY - SUNDAY. This price also includes entry into the event for all 3 days including both days of #AFTERGRID music. *Ages 12 and under are free and do not need a ticket. Automatic Upgrade to VIP Turn 10 Camping Area. CAMPING IS NOT INCLUDED - VIP TICKET HOLDERS MUST ALSO PURCHASE A CAMPING PASS. VIP TICKET HOLDERS WITH A GA CAMPING PASS - WILL AUTOMATICALLY BE UPGRADED TO TURN 10 VIP CAMPING AREAS. The Legendary Eibach Meet heads to GRIDLIFE South. THIS TICKET IS FOR THE EIBACH MEET ONLY. YOUR CAR MUST BE A HONDA OR HONDA POWERED AND MUST BE APPROVED FOR ENTRY. This is festival style car camping. Each vehicle will get roughly a 20x20 spot to park and set up camp. Additional passengers in the vehicle must also have a Spectator / Car Pool Camping Pass. Camping Per Person / Vehicle not included. Stay on site on all weekend and don't miss a single moment of the GRIDLIFE Experience. This ticket is a general camping pass for carpool passengers. Price is PER PERSON • Vehicle entry not included. RV Passes do not include Hookups of any type. Generators are allowed. NEW FOR 2019! RV Hookups. We are opening up the RV Campground between turn 8 and 9 for the first time at GRIDLIFE. Registrations are currently full. More spots may be added as the event gets closer. This ticket is for approved Drivers only. 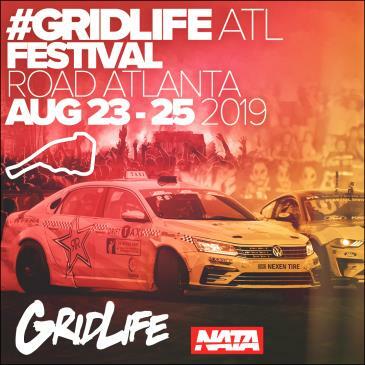 #GRIDLIFE South will feature drifting both Friday and Saturday with over 3 hours of track time. Once again we will be running our exclusive 2 zone format with drifting on both the the Horseshoe and through the Esses. Drivers tickets include your 3 day pass into the festival as well as camping throughout the weekend. ULTRA LIMITED TrackSide Crew Corral. Lock down your space for the whole weekend with a dedicated 50x50 Campsite for the whole squad overlooking the ESSES. Leave the setup to us and GRID in style in our new Track Side Turn 10 GlampGround.